Favorite food: My puppy food right now. Favorite toy: My blue teddy and fingers. Favorite activity: Chasing my brother marshmallow around and just hanging out with my humans brothers Joseph and Jessy. Special talents: I am just a little baby now but I am sure I will have quite a few later. Most embarrassing moment: Really haven't had one yet but stay tuned. Most trouble I ever got into: Right now I am pretty good! My favorite friends: Marshmallow, Joseph and Jessy and the cats teddy and otis. 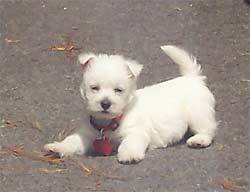 Biggest adventure: I love to go the bus stop with my mommy and marshmallow.I will start walking if I get to tired my mommy will carry me the rest of the way.